Hello and welcome to my Martin DX1RAE review. The DX1RAE is part of Martin’s X Series guitars which all fit in around the 700 to 850 price range. In order to give the best possible description of the guitar I will not just tell you my opinion on it but also provide videos and user reviews so that you can get a wider perspective. I will end the review by making a call on what type of player the guitar is best suited to and whether or not it is value for money. The DX1RAE is a dreadnought shaped guitar so it has good volume and a driving sound. Let’s see what materials are used for the construction of this guitar and how they affect the guitar’s tone. I had no idea what this guitar was made of before I played it. Which is probably a good thing. Had I known the amount of man-made and laminate materials that were on it I may have starting playing this guitar with a bias against it. Thankfully I didn’t because I found this guitar a real joy to play and loved the tone. Tone of course is very subjective so let’s take a look at the materials used and the tone you can expect out of the DX1RAE. One part of the guitar that is solid wood is the top. In my opinion this is the most important part that should be solid wood. The DX1RAE has a solid Sitka Spruce top. Sitka Spruce is the standard in acoustic guitar tops and it does a great job of being an all round top which gives clarity to a wide tonal range and expresses dynamics well. The back and sides are made from high pressure laminate Indian rosewood. In some ways you would ideally want to see solid wood back and sides but on a $750 guitar you will typically see some areas where laminate woods are used to save costs. That said I personally didn’t notice it affect the tone in a bad way. And the advantage of laminate is that it is strong and can be less prone to warping than solid wood. Maybe it sacrifices a little bit in tone but I certainly didn’t notice it. The bracing is an X Series specific bracing – the second video below talks a little bit more about the bracing if you want to know more. 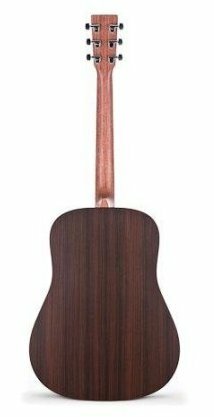 Surprisingly the neck is made from Stratabond rather than mahogany (which is most often used in acoustic guitar necks). Stratabond is a laminate wood material. I was very surprised to learn this because after playing the guitar one of the first things I mentioned to my girlfriend was how light but strong the neck felt – how I thought it felt really nice! Again I’m unsure how this material will affect the tone but in the end I really liked the tone so it can’t of done anything too bad to it. Maybe I’m coming around to man-made materials a bit more – heaven forbid! Apparently it is seriously strong and is likely to be more resistant to warping so I’ve got no problem with it. Some people have complained about the look of it and how it doesn’t match the back and sides but my first thought was that it actually looked quite nice. The DX1RAE’s neck has a ‘rust’ finish. The bridge is made from Black Richlite – so while it looks like ebony this is actually another man made material. I don’t know a lot about this material but they also use it for the fretboard (see playability below). The nut is made from something called Corian. This is again a man made synthesized material. No telling how this affects the tone but this is something that could be changed (by an experienced luthier or yourself if you know what you are doing) if you wanted to experiment with different materials. The saddle is made from TUSQ – which is a synthesized material made by Graphtech specifically for guitar nuts and saddles. The idea of this stuff is to emulate bone but with more consistency. Some people swear by bone, others prefer Tusq, some can’t tell the difference. The DX1RAE is fitted with Fishman Sonitone electronics. It doesn’t have a cutaway. I wouldn’t go as far as to say that it’s weird to have an acoustic-electric without a cutaway, but more often than not acoustic guitars do have a cutaway when they have electronics. So if you’re looking for a guitar that will give you that full non-cutaway sound when not plugged in – but still want the ability to plug in as well, then the DX1RAE is a great option. To get the best idea of the tone of this guitar check out some videos of the guitar being played below. Whilst it never sounds the same as in real life these should give you some idea. This first video is great as it demos the guitar unplugged and plugged in so you can get an idea of what it sounds like under both conditions – it also shows strumming and finger picking both plugged and unplugged (watch for the tags that let you know when it’s plugged and unplugged). This next video feels pretty apt for me as when I tried out the Martin DX1RAE I also tried the Taylor 110e. This video shows the two of them being compared. I warn you it’s a long one but it does give you heaps of detail on both guitars. I found this guitar really nice to play. I’m not sure if this was in spite of, or because of, all the man made materials but it did feel smooth and easy to play and to get the guitar to make the sounds you are trying to produce. The fretboard looks like ebony but is actually something called Black Richlite. I have no idea how this holds up over time but my first impression of playing it is that it was a nice surface to play on. So I wouldn’t let the fact the fretboard isn’t wood put you off. The action felt just right actually. I preferred the action on this than the Taylor 110e which I felt could have been just a tad lower. The DX1RAE was set up just right for how I like it. For those who like smaller necks the DX1RAE has a 1 and 11/16th inch neck (measured at the nut) which is just a tad smaller than the standard. The 110e had that same width neck but somehow the neck on the Martin felt smaller. I think this was because of the shallower oval shape of the back of the neck. For those who are interested in how this guitar got its name here it is. Check out what others think of the DX1AE at the links below. 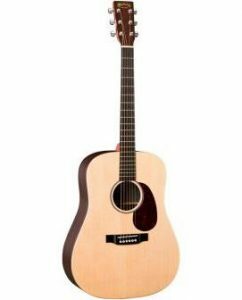 This guitar, being a dreadnought is naturally suited to those who play rock, pop, blues, country etc. However if you are more of a folk player or prefer a smaller sized guitar for whatever reason but you want a similar tone and playability then there is always the 000X1AE which is in the Grand Auditorium size. The only other difference on that is Mahogany HPL back and sides – and the size and shape of course. Anyone who likes a slightly less bright, warmer tone should definitely check out the DX1RAE – it’s still a Sitka Spruce top so it’s certainly bright enough – but just mellowed out a bit compared to your average sitka-spruced topped guitar. Also if you’re looking for a guitar without a cutaway but still with electronics then the DX1RAE should be on your list of options – assuming you like the tone. And try not to be put off by all the man made construction materials – it certainly doesn’t hurt the tone or the playability – in fact it may be due to these materials that this guitar sounds and plays so nice for its price. For tone and playability I would definitely give this a tick for value for money. This kind of tone and playability for $750 is a great deal – and you may well be able to find it on sale somewhere and get it even cheaper. In terms of solid woods, I think you get better value for money out of the Taylor 110e and particularly the Seagull Artist Mosaic but for sound and playing I preferred the DX1RAE over the Taylor 110e. I do prefer a warmer tone and tone is highly subjective so you may prefer the Taylor’s tone, which is brighter than the DX1RAE. If the DX1RAE sounds like a guitar you might be interested in and want to learn more about it, want to research current prices or availability, then check out the links below to learn more. I hope that this review has given you a thorough overview of Martin’s DX1RAE. If you have ever played or own this guitar it’d be awesome to hear from you. Just leave a comment below. All other comments and questions also very welcome. I’ve got a Martin DVX1E that I’ve had for a few years but not worthy of having one. I need to rise above couch potato level. 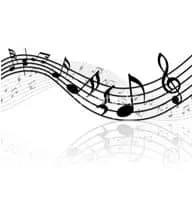 Great info here and hope to learn and improve my playing abilities with your site. Hey Larry – glad you checked out my review. I haven’t heard of the DVX1E – but I assume it’s part of the X series. If so it’ll be similar to the DX1RAE in terms of the black richlite fingerboard and other synthetic materials. What do you think of these? Do you notice the difference between them and wood? I just purchased this guitar (DX1Rae) for about $500.00 less than list at a going out of buisness sale. I had only played it for a few minutes and knew I wanted it regardless of the price. What a deal I got. I have been playing guitar for over forty-five years and to my ear this is the best sounding guitar I have ever owned. Crisp, clear, great action, nice rounded sound. Its not fancy, but then neither am I.
I play all kind of music and it works great for them all whether I’m finger picking or strumming. It’s the sound that really matters to me, and this guitar has the sound. Thanks for your input. Sounds like you got the DX1RAE at an awesome discount! Especially given how reasonably priced it already is. Glad you are happy with it. But I’m not surprised, it’s the best guitar under 1,000 that I’ve played. Have both Dx1rae and the gpcpa5k. Play in church, both through direct box. Used to play Gretschs, but they wouldn’t project like these both do. In our 13 piece orchestra, my wife plays flute and says she can hear me much better in the system than the Gretschs. Our sound man loves them both, (he may be turning me up a tad, Lol!) sold Gretschs, only other guitar I have now is Takamine 341, which sounds and plays comparable, so I rotate the 3 ! Both sound and play great. Have been playing for about 60 years, in a few bands, but 100% in church now. Thanks for your input. Great to hear how the DX1RAE and GPCPA5K sound through a direct box – and how they sound as part of a 13 piece orchestra. Hi just got this guitar at a pawn shop for 500.00 they threw in a case tuner strap. This guitar sounds and plays beautiful. Thought this had to be twice what i payed for it going by sound and playability. Thanks for your input. Yeah a great guitar, especially for the price – and you got it even cheaper, so that’s an even better deal! The Dx1rae is a great crafted guitar how ever I am hard pressed in obtains one just like the one you chose for viewing in your video demo yours show the jack strap insert a brilliant idea not so brilliant is martins idea of producing a jack insertment threw exposed wood it sounds superb with mic placement not so great with a simulated sound of pickup not only in Martin models but any other acoustic guitar on the market to day I’m yet to find a pickup that even comes close to trueness of sound then a good mic and it’s placement the only pickup that comes close is the k&k mini solo with a condenser mic instalment is the best of all attempts that’s out there if I could obtain your Dx1rae with out an installed pick up I would take that option first the other option is to get one like your video demo of strap jack placement how do I go about finding one like that instead of the exposed jack threw a awsome crafted piece of work only to deface visually I think an exposed configuration of jack placement to an affordable second to none model for its price.